People inspect a damaged tricycle at the site of a bomb explosion, caused by a female suicide bomber in a market in Maiduguri, Nigeria, July 31, 2015. Nigeria's president has ordered the military to defeat the Boko Haram insurgency within three months. President Muhammadu Buhari spoke in Abuja Thursday as he swore in four new military chiefs. Buhari replaced the heads of the army, navy, air force and his chief of defense staff soon after taking office May 29, in a effort to re-energize the fight against Boko Haram. The militants have killed nearly 1,000 Nigerians in raids and suicide attacks since Buhari was inaugurated. Buhari urged his new military chiefs to also bring an end to armed banditry and kidnapping. "You need to... team up with other stakeholders to come up with a well- coordinated, joint effort which will bring a desired end to these insurgencies within three months," he said. The military under former President Goodluck Jonathan was heavily criticized for failing to stop the six-year Boko Haram insurgency. 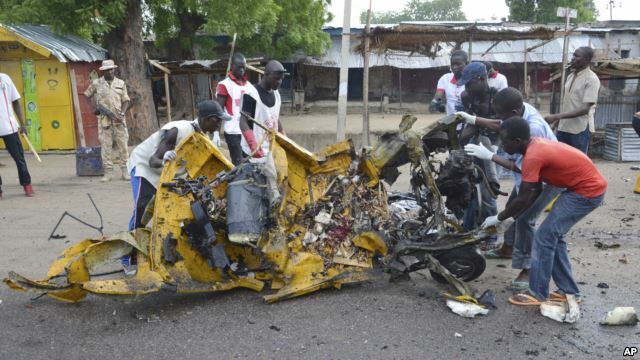 The group, which recently pledged allegiance to the militant group Islamic State, has killed more than 10,000 Nigerians as part of a campaign to impose Islamic rule on northern Nigeria. Nigeria and four nearby countries — Chad, Cameroon, Niger and Benin — are expected to soon deploy a force of more than 8,000 soldiers to fight Boko Haram.